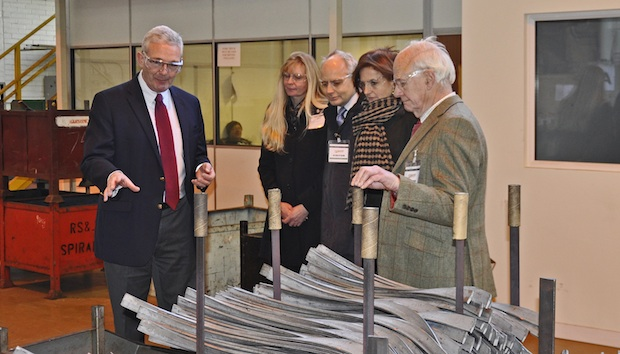 Bertram Rope, the great, great, great grandson of the founder of the Ransomes business back in 1784, together with his son Simon, daughter Amelia and Simon’s partner Louisa Knapp, visited Ransomes Jacobsen’s manufacturing facility in Ipswich as the guests of Managing Director Alan Prickett. Over light refreshments, the group were given an overview of the business before embarking on a tour of the factory to see how today’s commercial mowers are manufactured. “This was a wonderful experience. Alan and his team could not have been more hospitable; the atmosphere around the business was fantastic and it’s obvious that they have very skilled, loyal and professional workforce building this equipment. “It was a delight to host the Rope family here today. They showed tremendous interest in the business and were genuinely impressed with the range of commercial turfcare products we produce here in Ipswich. Ransomes Jacobsen is a Textron Inc (NYSE:TXT) company. More information on the product offering can be found at www.ransomesjacobsen.com.